The research on charitable giving reflects more activity (time and money) from conservatives rather than liberals. Political party affiliation has little bearing on the number of “green” actions people take, a new study by Porter Novelli and Mason's Center of Excellence in Climate Change Communication Research shows. According to the survey of more than 11,000 American adults and nearly 1,000 of their children, Democrats and Republicans differ only slightly when it comes to taking actions to protect the environment, despite great differences in their perceptions of danger related to global warming. While Democrats were almost twice as likely as Republicans to believe that global warming is a serious problem and a threat to all life on the planet, on average they perform only about 15 percent more “green” actions than Republicans. For more information on the survey and methodology, and to see the full study, visit climatechange.gmu.edu. Jatropha (revisited)-- on Kiwi planes! Click here to read about the successful first flight on December 30th. Britain's Department for Environment, Food and Rural Affairs spent £50,000 to research whether disposable or cloth diapers left a smaller carbon footprint. cloth diapers could compete environmentally, but only if their users kept them for years, air dried them, and washed them at temperatures below 60º C (140º F). NASCAR is famous for their left-hand turns. UPS is focusing on right-hand turns-- to save time and money. ...computer mapping software and traffic modeling has led them to conclude that delivery drivers should avoid making left turns...[since they] waste time and gas idling while waiting for left-hand turn signals...By mapping out routes that aim for only right-hand turns, the company saved 3.3 million gallons of gasoline [and $9 million] in 2007.
almost as impressive as water into wine?! Britain's Prince Charles recently jumped on the biofuels bandwagon, converting his seldom-used 1960 Aston Martin DB6 to a biofuel system that allows him to run his classic convertible on wine rather than gasoline....The prince gets his wine from an English vintner who would otherwise have to destroy any wine produced above the European Union quota. Charles' switch to a biofuel may curb a smidgen of carbon dioxide emissions, but it likely won't save him much money: The wine costs only slightly less than the gasoline he'd buy for his classic. Aside from the tech advance, note the quota on wine-- to keep prices higher for sellers and consumers. The company's love affair with conversions began in 2006, when it bought six new Volkswagens and had them converted by a Louisville company, The GoodOil Boys, using kits made by Greasecar Vegetable Fuel Systems in Easthampton, Mass. Since then, it has added a 2004 Jetta, an Isuzu box truck and a Ford F-450. Conversion includes installing a second fuel tank for the vegetable oil and running a second set of fuel lines. Converted vehicles can burn either regular diesel or oil -- and must be started and warmed up on petroleum, especially in cooler weather. Once the engines are warm, the driver flips a lever to switch from diesel to vegetable oil. When shutting down, the driver switches back to diesel for a moment "so the vegetable oil doesn't coagulate in the line." For a company that hates to gamble, Toyota put a big stack of chips on the table when it decided, in 2003, to build pickup trucks in Texas. After debating the move for years, the Japanese automaker broke its own rules in order to plant a flag in the heart of truck country, hoping a Texas-built Tundra would earn the all-American cred needed to invade the one bit of automotive turf still dominated by its domestic competitors....By the time trucks started rolling off the line in 2006, the project seemed more like a public-works boondoggle than the kind of lean operation Toyota is famous for, with costs ballooning to $1.3 billion—60 percent over budget. NBC rejects this Super Bowl ad?! Hopefully, a lot of people will see it for free! If you leave your house with your water turned off, when your electricity comes back on, your icemaker's solenoid valve will burn out if you have not turned off your ice maker. If you have not drained the water out of the pipes by opening all faucets, the pipes may still freeze and burst. Flush all toilets. Then pour RV anti-freeze in the bowl and a little down every drain to prevent drain traps from freezing and breaking. Sponge the water out of the tank of your toilet. If your water heater is electric, you may want to drain it. If your water heater is gas, you may want to turn the thermostat all the way down. To get the heat from the center of the house to pipes near outside walls, open all kitchen sink and vanity cabinet doors and remove what is under there. Open all shower doors and curtains. But the states aren't innocent victims. Their revenues have collapsed of late, but the main reason so many states are broke today is because lawmakers thought the days of living well would last forever. what will Gov. Daniels and the IN legislature do with "the money"? It's a bad idea to borrow money (more debt; higher taxes or less spending later) to try to buy ourselves out of a recession now/soon, especially with a dog's breakfast of spending largely in the future. But once it's rolling, the question then becomes how to best spend the resources you've been given. Indiana's primary goal for spending any money it gets from a federal economic stimulus package should be putting more residents to work and doing so quickly, according to Gov. Mitch Daniels. When asked if some of the money could be used for a one-time state tax cut, Daniels said it was a possibility if cuts were directly related to job creation. According to the Daniels administration, more than $1 billion from economic stimulus money is expected to go directly to schools. He said school officials, too, should look to spend the money for one-time purposes. How is that going to stimulate the economy? Perhaps construction jobs, but that will take years to implement! In any case, this is an amazing bow to the teachers' unions. how is future spending going to help us now? There are three lags which make it far more difficult for "fiscal policy" to deal with a recession: one must recognize the problem (no problem today), one must implement a solution (that's going pretty well), and the solution must manifest itself (when will the tax and spending changes get into and filter through the economy). With the current proposal, the latter is a huge problem. This signals ignorance of economics-- and most certainly, a focus on "politics": a preeminent goal to satisfy special interest groups with particular spending items &/or to take credit for the recession when it will end on its own. The problem is that the money for this spending boom has to come from somewhere, which means it is removed from the private sector as higher taxes or borrowing....Mr. Barro wrote about this way back in 1974 in his classic article, "Are Government Bonds Net Wealth? ", in the Journal of Political Economy. Larry Summers and Paul Krugman must have missed it. Apart from the inevitable waste, the Democrats are taking a big political gamble here. Congress and Mr. Obama are promoting this stimulus as the key to economic revival. Americans who know nothing about multipliers or neo-Keynesians expect it to work. The Federal Reserve is pushing trillions of dollars of monetary stimulus into the economy, and perhaps that along with a better bank rescue strategy will make the difference. But if spring and then summer arrive, and the economy is still in recession, Americans are going to start asking what they bought for that $355 billion. It is an interesting political gamble: will they get credit for getting rid of the recession if it goes away on its own-- or like FDR, will the recession continue largely unabated (or worsen), saddling the country with more debt and sacking the incumbent party? They call it "stimulus" legislation, but the economic measures racing through Congress would devote tens of billions of dollars to causes that have little to do with jolting the country out of recession. There's $345 million for Agriculture Department computers, $650 million for TV converter boxes, $15 billion for college scholarships - worthy, perhaps, but not likely to put many Americans back to work quickly. Yes, there are many billions of dollars in "ready-to-go" job-creating projects in President Barack Obama's economic stimulus bill. But there are also plenty of items that are just unfinished business for Congress' old bulls. An $800 billion-plus package, it turns out, gives lawmakers plenty of opportunities to rid themselves of nagging headaches left over from the days when running up the government's $10 trillion-plus debt was a bigger concern. ...lawmakers are able to thin out their in-boxes, even if they aren't doing much to create jobs. Whatever else they think about the $819 billion economic recovery plan passed Wednesday by the U.S. House, all sides should keep in mind that the federal government and the nation are in uncharted waters. No one really knows if measures contained in the bill will work to resuscitate the economy, which is battered by an extraordinary mix of financial, credit and housing crises. And if some steps do succeed, which ones will they be and how quickly will we see positive results? The one point almost everybody agrees upon is that doing absolutely nothing is not a responsible option. The most promising course is to try a lot of different approaches and see what proves to be helpful. The first sentence is not true-- among those with some expertise and those without a special interest in seeing more spending. The second sentence is a.) weird; b.) the sort of thing we did in the Great Depression; c.) reminds me of a euphemism regarding offal and a wall; and d.) contradicts the opening (if we do a bunch of stuff, we won't have any better idea of cause and effect after this is over). Aside from the assertion that such things are "worthy causes", the C-J'ers are definitely correct that they are not particularly "stimulative" and should be considered separately. The editorialists wrap up with this excellent sentence-- except that it is aimed at Republicans. Again, for the C-J, blame mostly flows one direction. Narrow political calculations must be put on hold. Nice rhetoric, but not true any more. Many if not a majority of the wealthy are Democrats. And Dems are comprised of and supported by a higher proportion of well-connected special interest groups. ...the party whose assaults on government and government regulation have helped give us all an opportunity to experience what our relatives endured in the 1930s. Nice rhetoric, but the party's assault on us has been a function of much more govt spending and regulation. It's always funny hearing people describe Bush and his (Democratic and Republican) Congresses as small-govt. And of course, for the C-J, the Dems apparently get no blame. ...urged bipartisanship by, among other things, scolding Democrats for not recognizing the mandate won by George W. Bush in 2004 and the Republican Congress and putting "Social Security reform on the agenda." Southeast Christian Church says it can take up to 300 people in a shelter it is opening at its Sports & Fitness Center. The shelter opened last evening, but is not equipped for those needing medical attention. Guests are asked to bring their own bedding and toiletries. No pets are allowed. Southeast Christian Church is at 920 Blankenbaker Parkway. Use entrance 3 or 4 off Watterson Trail to access the Sports & Fitness Center. There's the economics of Zipcars-- and then there's part of the politics of Zipcars, including taxes. Interesting questions here-- taxation in general, taxation with respect to externalities, differential taxation, and so on. In cities around the country, fans of Zipcar Inc. and other car-sharing companies are seeing prices rise for those jaunts to the grocery store. For that, they can blame the taxman. Rental-car taxes are already paid by the big players like Enterprise Rent-A-Car and Hertz. But since customers often use car-sharing services for just a few hours, those extra charges can end up making members' bills a lot higher....The issue is creating a lobbying headache for the small, up-and-coming car-share industry and putting it at loggerheads with traditional car-rental companies. Armson belongs to a fleet of cars owned by Zipcar, a company that has turned the concept of car rental on its head. There's no waiting in line, and there's no spiel on upgrades or insurance. In fact, there's no face-to-face interaction at all. Customers apply to become members—or "zipsters"—and reserve vehicles online. And forget about getting stuck with a Ford Taurus or Chevy Cobalt. Zipcars, which are scattered throughout city neighborhoods, are fun and whimsical (think Mini Coopers and Volkswagen Jettas with names like "Dagwood" and "Jinglebell"). Car doors unlock with the flash of a pass card over a sensor on the windshield, and a key hangs from the steering column. Gas and insurance are included in an hourly rate, which tends to range from $6 to $10. Carbon: tax, trade or deregulate? We should never take money from people to give to corporations-- for energy or anything else. To the extent that there are social costs associated with pollution, then a relevant tax can be an improvement (at least on paper). But subsidies put govt in the position of trying to pick winners as a second-best solution-- rather than dealing with the root of the problem. A reduced version of Table ES1 (Table 1 in the Executive Summary) provides "Energy Subsidies and Support by Type and Fuel, FY2007 and FY1999 (in millions of 2007 dollars)"
-Marked increase overall, more than doubling for all forms of energy. -Oil and gas were up 3%; overall share of subsidies fell from 24% to 12%. -Coal and nuclear were up 70%. -All coal (including "refined coal") was up 6x. -Renewables were up 3.5x; conservation was up 5x. -I'm not sure this is what one would expect from the stereotype of Bush. -The continuing emphasis on coal reflects geographical and unfortunate political realities. Is there a better example of the short time horizons of politicians-- and behind that, those of the general public? In the campaign, it was all about gas prices until the Fall-- and then it was all about the macro-economy. Now that gas prices are low again-- because of the improving dollar (for now) and reduced demand (for now)-- no one's talking about drilling anymore. A convenient political issue and a bright shiny object which distracts the public. But if it was a good idea in June, it's still a good idea now. Brazil discovered only yesterday (in November) that billions of barrels of oil sit in difficult water beneath a swath of the Santos Basin, 180 miles offshore from Rio de Janeiro and Sao Paulo. The U.S. has known for decades that at least 8.5 billion proven barrels of oil sit off its Pacific, Atlantic and Gulf coasts, with the Interior Department estimating 86 billion barrels of undiscovered oil resources. When Brazil made this find last November, did its legislature announce that, for fear of oil spills hitting Rio's beaches or altering the climate, it would forgo exploiting these fields? Some portion of the current $4-per-gallon gasoline may be attributable to the Federal Reserve's inflationary monetary policy or even speculators. But we can wave goodbye to the $1.25/gallon gasoline that in 1990 allowed a President Bush to airily lock away the nation's oil and gas jewels. This isn't your father's world of energy. New world powers are coming online fast, and they need energy. We need to get back in the game. In his latest dispatch on the state of the world, "Hot, Flat, and Crowded," Thomas L. Friedman makes it clear that he wants to improve conditions for mankind....But because of climate change (hot), ever-more people (crowded) and higher material aspirations of all in a competitive global economy (flat), he believes that the world's growth is leading us toward catastrophe. Where in the world can we do the most good? That is the basic question addressed by the Copenhagen Consensus Center, a think tank founded six years ago by the Danish statistician Bjorn Lomborg. To answer the question, the center periodically convenes panels of leading economists, who weigh and prioritize the solutions experts have proposed to the world's biggest problems. I haven't read any of Lomborg's stuff-- aside from essays and interviews-- but it sounds interesting! More than 78,000 people are on the national waiting list to receive a kidney from a deceased donor. The need for kidneys has soared with the rise in diabetes and obesity and the wait can last for years. I have a better idea: after endless deficits and innumerable complaints about service quality, why don't we allow competition and the private sector into the market? Massive deficits could force the post office to cut out one day of mail delivery, the postmaster general told Congress on Wednesday, in asking lawmakers to lift the requirement that the agency deliver mail six days a week. If the change happens, that doesn't necessarily mean an end to Saturday mail delivery. Previous post office studies have looked at the possibility of skipping some other day when mail flow is light, such as Tuesday. It's that crazy "elasticity of demand curve" thing. Increasing rates-- for the post office or marginal tax rates-- does not necessarily increase revenues. As such, we might expect the USPS to continue its downward spiral. OK, Potter's paying attention to E100: if increasing rates hurt revenue, maybe it'd be stupid to keep doing that! Is it "global warming" or "climate change"? Huh? I pressed the gas pedal today to stop my car. Or I hit the brakes to accelerate. Or I smoke crack to remain sober. It's interesting to see Gore's primary take-away from his 1992 dealings with Ross Perot. As Horner notes, Clinton didn't push this either. If you don't like this outcome, blame both of them. Interesting-- in that he accepts a role for nuclear and that Mr. Silver Bullet doesn't see this as a silver bullet. "Ten Principles of Energy Policy"
Unhindered and unsubsidized competition among energy technologies is the best means to discovering tomorrow’s new energy sources. Elected officials should refuse to try to pick winners, even though doing so may score points with one group or another in the short term. Here's an excerpt from Sallie Baliunas' paper posted at the Heritage Foundation. Every 20 to 30 years, the Pacific Ocean changes sharply. The sudden shift is called the Pacific Decadal Oscillation, or PDO, and produces an ocean, air, and wind current shift. Fishermen will notice, for example, migrations of fish species along the West Coast. In 1976-1977 the Pacific Decadal Oscillation shifted, and is labeled the Great Pacific Climate Shift of 1976-1977. As a result, temperatures changed dramatically from their former average (since around 1946), and returned to warmth seen from around 1923 to 1946. So sharp is the shift that the appropriate thing to do is to look for a secular trend (which might be the human-made trend) before 1976-1977, and then after 1976-1977. But drawing a straight line through that natural event should be avoided. The PDO is natural, because proxy records--of tree growth, for example--detail the oscillation going back several centuries, which is prior to human activities that significantly increase the content of greenhouse gases in the air. And also known from computer simulations is that the human-made warming trend is supposed to grow steadily over decades. So, a shift all at once in 1976-1977 is ruled out by those two reasons. One, it's not what the models project; and two, we see this event before the build-up of human-made greenhouse gases, and it is therefore natural. Here are two more papers by John D'Aleo-- the original paper and an addendum. 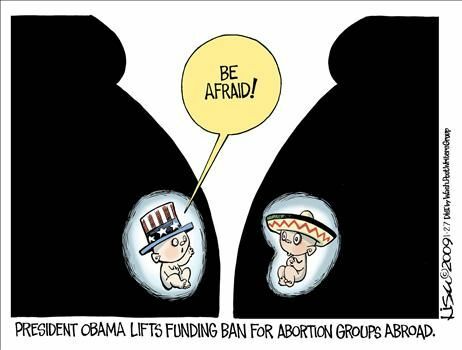 a pro-life cartoon in the C-J! I'm dividing this review into four parts: some lovely quotes on global cooling; his discussion of global warming and cooling; "the debate" including the tactics of those in the "consensus" view; and the political and economic responses (below). Horner opens his preface by noting that "global problems demand global solutions...thus helping to bypass the irritating obstacles posed by sovereignty and democratic decision-making" (p. xiii). We see the same sort of thing with the "trade deficit" (in goods and services). A problem is blown-up and extended to a national concern, implying national solutions are required (protectionism). Interestingly, from the apocalyptic rhetoric, Horner wonders whether any policy imaginable would solve the problem. He cites Gore who compares all of this to World War II and wonders whether Gore's war will also feature "internment camps, food and fuel rationing, and conscription" (p. xiv). At least Senators McCain and Lieberman have the humility to declare theirs to be "a modest first step". One trembles for the economy when they imagine Mr. McCain's immodest second step. Greens are sometimes nicknamed "watermelons" (p. 7)-- green on the outside and red on the inside. Of course, this is ironic, given the environmental records of Communist countries (p. 8). In fact, capitalism (including regulation for externalities) offers the best way forward. I'm dividing this review into four parts: some lovely quotes on global cooling; his discussion of global warming and cooling; "the debate" including the tactics of those in the "consensus" view (below); and the political and economic responses. Greens are persuasive in their passion...really believe in what they preach-- at least in their cause if not the claims....The greens have one great weakness: they are wrong both in the economics and science of most every issue they now pursue (p. 14-15). Stephen Schneider: To capture the public imagination, we have to offer up some scary scenarios, make simplified dramatic statements and little mention of any doubts one might have. Each of us has to decide the right balance between being effective and being honest (p. 40). Al Gore: I believe it is appropriate to have an over-representation of factual presentations on how dangerous [global warming] is, as a predicate for opening up the audience to listen to what the solutions are (p. 209). The easiest job in the world would be "director of research" for an alarmist environmental group, given their propensity for simply making things up...Greens are remarkably hard-wired to turn every conceivably relevant occurrence into proof of their current alarm (p. 40). I think this is changing now, but Horner argues that "Debate and dissent are intolerable: No honest person could disagree with the catastrophists; therefore, dissenters must be dishonest" (p. 4). Beyond that, he quotes author Mark Lynas and 60 Minutes reporter Scott Pelley who both compared Global Warming deniers to Holocaust deniers (p. 35). The other side has matched this bogus approach to public advocacy. But clearly the GW'ers fired the first (bunch of) shots. Horner quotes Dyson who said that only one climate model predicts El Nino before noting that climate models are "essential tools for understanding climate [but] they are not yet adequate tools for predicting change" (p. 113). And from Horner (p. 233-234): The global cooling alarmists in the 1970s loved to cite one positive feedback loop: as things got cooler, more snow and ice would cover the planet, reflecting more of the sun's rays (thus absorbing less), causing the surface and the water to cool even more. Thus, cooling leads to more cooling. Today, they tell us that warming leads to more warming. Except for [some] who argue that warming leads to a new ice age. The alarmist consensus is that a little bit of warming will cause something disastrous. It's interesting that lefties envision and have tremendous faith in dynamic environmental models (at least those that fit within their worldview)-- and static economic models (e.g., in failing to imagine the impact of regulation, bailouts, tax policy, etc.). I'm dividing this review into four parts: some lovely quotes on global cooling; his discussion of global warming and cooling (below); "the debate" including the tactics of those in the "consensus" view; and the political and economic responses. The main hole in the "settled" theory of catastrophic Manmade global warming is that it is not catastrophic, manmade, or global (p. 65). Manmade greenhouse gases are a tiny fraction of one factor (p. 69). Warming is happening, but it is slight, it is relative, and it is not "global" in that it is not warming everywhere (p. 70). Don't most flora and fauna live in warmer areas...the same reason that 90% of Canadians are huddled near their southern border?...Finally, we need to ask whether warmer is necessarily worse...Cold is not only not pleasant, but it kills like heat rarely can (p. 74). Time to review another book I read in preparation for the Congressional campaign: Christopher Horner's The Politically Incorrect Guide to Global Warming and Environmentalism. I was anticipating more questions about global warming (at least in the debates). My response on this topic had been one of my two weak answers in the Bloomington debate. I gave a measured-- and it turns out correct-- response. But Hill was either ignorant in his avid advocacy or smart in playing poker. He came out swinging and I was neither sure enough nor prepared enough to provide a tight rebuttal. I also read Singer & Avery's Unstoppable Global Warming-- Every 1500 Years. (I reviewed it earlier.) By way of comparison, as you probably can tell by the title, Horner's book is less academic, more cynical and sound-bitey of the two. Horner's book is funny and clever-- and a nice intro for those looking for a lighter (but still effective) touch on a serious subject. I'm going to divide this review into four parts: some lovely quotes on global cooling (below); his discussion of global warming and cooling; "the debate" including the tactics of those in the "consensus" view; and the political and economic responses. Betty Friedan in 1958 Harpers: "Certain signs, some of them visible to the layman as well as the scientist, indicate that we have been watching an ice age approach for some time without realizing what we are seeing...Scientists predict that it will cause great snows which the world has not seen since the last ice age thousands of years ago." Hmm...This may explain this week's snow storm! And it's good to see Betty expand her horizons from feminism to climatology. Nigel Calder (1975): The threat of a new ice age must now stand alongside nuclear war as a likely source of wholesale death and misery for mankind. I guess he was right in that neither happened. That was very clever-- to compare the probability of two events to each other. Reid Bryson (1971): The continued rapid cooling of the earth since WWII is in accord with the increase in global air pollution associate with industrialization, mechanization, urbanization, and exploding population. A beauty of a quote, huh? And of course, I hate when my population explodes. We all know how painful that can be. Douglas Colligan (1975): The world's climatologists are agreed...Once the freeze starts, it will be too late. Absolutely. So when is it going to start, Doug? Newsweek on global cooling (1975): "this trend will reduce agricultural productivity". OK, I'm sure they were glad to hear about global warming! Fortune (1954): Despite all you may have heard, read, or imagined, it's been growing cooler-- not warmer-- since the Thirties. Wow, maybe they were correct after all? Cooling does paint a far more frightening picture given that another ice age would be truly catastrophic, while throughout human history, warming periods have always ushered in prosperity. Maybe that's why the greens tried "global cooling" first (p. 62). If, like the greens, we are willing to cite a short period of time in order to claim a long-term trend, then a possible cooling trend began in 1998, despite further, massive, worldwide increases in fossil fuel use (p. 116-117a). Horner also notes a Business and Media Institute report, finding that the New York Times "has engaged in at least four separate campaigns about climate change...since warning of a new ice age in 1895" (p. 182-183). It was cooling in 1895, a concern reinvigorated in 1924 and 1975-- with warming articles starting up in 1933 and over the past 15 years or so.